This entry was posted on July 20, 2014 by Tinteán Editorial Team/EMcK, in News, What's On... and tagged Celtic Music, Lake School, Song and Dance;. Bookmark the permalink. 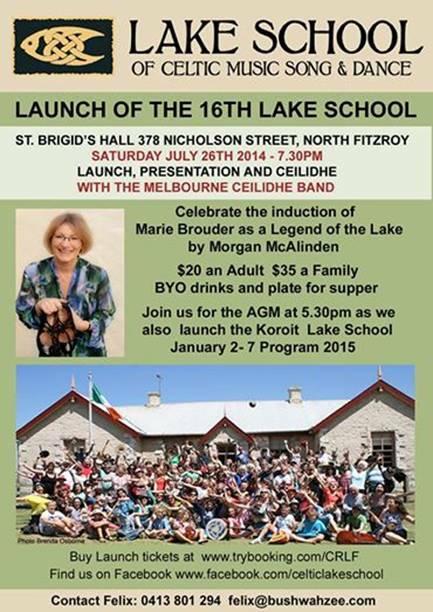 Nature of event: Launch of the 16th Lake School of Celtic Music, Song and Dance; including the induction of Marie Brouder as a Legend of the Lake. The Melbourne Ceilidhe Band will provide the music. Cost: Adults $20; Families $35; BYO drinks and a plate.